Dated the 6th March, 2018. I am directed to refer to this Ministry’s letter No. 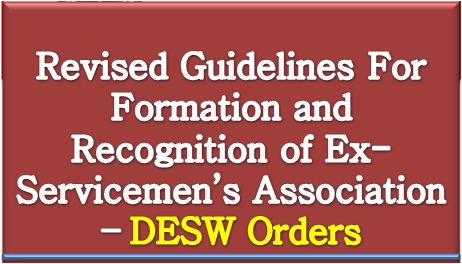 9(37)92/US(WE)/D(Res) dated 31.1.1996, on the subject mentioned above and to revise the guidelines for formation and conduct of Ex-Servicemen Associations and their recognition. (b) The Associations should have a minimum membership of One Lakh. This membership, however, in case of associations exclusively of Naval Ex-Servicemen or exclusively of Air Force Ex-Servicemen should not have less than ten thousand members. War widows Associations and Disabled War Veterans Associations will be exempted from the criteria of minimum membership. (c) The Associations formed shall be with the sole intent of projection of grievances/recommendations/problems of Ex-Servicemen and for their amelioration to the Government through its Offices. The Ex-Servicemen Associations will not imply any right to negotiate to the problems/grievances of the Ex-Servicemen. (d) The Associations in no case should be formed on religious, social, linguistic, area and caste lines. They should be apolitical in nature with no affiliation or contiguity to any Political party or political Association. The Ex-Servicemen Associations shall not espouse any political or religious thoughts to its members or the society, nor should it be in possession of or maintaining any fund amassed through political or religious leaders. (e) The membership should be comprised exclusively of ESM and they should not be involved in any type of criminal activity/proceedings in any Court of Law. (f) No other source of fund is allowed to be collected by the Association except subscriptions. (g) The Associations should not be associated with any Foreign Government or Company/conglomerate and any foreign Governments. Under no circumstances should the association accept any donations/pecuniary benefits from any foreign concern/entity. (h) The Association shall in not way enter into any communication with any foreign entity. All such correspondences are to be exclusively channelized through the Government and the Government shall have the prerogative to withhold it, if it so deems necessary. (i) The Acts, charter and conduct of the Ex-Servicemen Associations should not be for anti-Government activities or for acts prejudicial to national interest and security. (j) The Association shall submit an undertaking affirming its faith in democratic principles and binding itself to resort only to the lawful activities for representing the Ex-Servicemen’s problems. (k) The Association shall not raise issues in the interest of any caste, tribe or religious denomination. (l) The Association shall not maintain any political fund or lend itself to the propagation of the view of any political party or a member of such party. (m) The Association shall be composed of Ex-Servicemen, widows and their next of kin only. (n) The Association should have a Pan India presence i.e., the Ex-Servicemen Association should be of all India Character and should have adequate number of branches at State and District level. Its Office bearers should be composed of a mix of personnel of all three servies and ranks. The Composite Associations representing Ex-Servicemen of the three services should have a balance of tri service representation and also balanced representation of all ranks i.e. Officers, JCOs and OR and equivalent rank of the Army, Navy and Air Force. The Associations shall submit duly verified list of its members and Office bearers once every year to Directorate General of Resettlement (DGR) after their Annual General Meeting. (o) The Association shall have duly elected body of office bearers from amongst its members only, valid for a specified period. (p) The Association shall have a Constitution/bye laws and its functioning should be strictly in accordance with the said charter of its adopted Constitution/bye laws. (q) Any amendment in the constitution/bye laws of the Association, after its recognition under these rules, shall be made only with the prior approval of the Government, if the recognition is to be continued thereafter. (r) The Association shall endeavour to hold at least one Annual Body Meeting every year, and the dates and schedule of which should be duly notified in advance to its members and its Office bearers with the proposed agenda points. (s) The Association shall maintain only one bank account for its operations. The persons authorized to operate these bank accounts shall be selected in its annual general body meetings. Changes, if any, at any later date(s) shall be with consensus and by a majority selection. (t) The Association shall have its accounts checked every year by a registered Chartered Accountant and copy of the audited accounts, as well as its annual report should be made available to DGR within thirty days of such check for information and scrutiny. (u) The Association shall inform the Government of all accounts operated by it on all social media platform and only the authorized Office bearers of the association are permitted to post messages on such sites. No offensive posts are to be posted. The Office bearers are to familiarize themselves with Indian IT Act prior to operating any such account. (v) The Association shall not publish any periodicals, journal, magazines, bulletins etc. without the prior consent of the Government. In no case writings of defamatory nature, vilifying any individuals, group of individuals, private sources and Government shall be permitted to be printed in such publishings. The publishings shall in no way disrupt any ties of the Government with any State Government/foreign concern/Government or any Government authority. The publishing shall also not be inimical to the Government or to the Society. The copies of all such periodicals, bulletins and magazines, journals (as the case may be) shall be supplied by the Association to the Department of ESW, DGR and KSB. (w) The communication addressed by the Association or any office bearers on its behalf to the Government or Government authority shall not contain any disrespectful or improper language. (x) In any communications addressed to the Government or in any panel on any national/regional television channels, it shall be ensured that the choice of language used is respectful and not defamatory of the Government or its agencies and such appearances should not be a tool to ignite passions for any particular agenda. (y) The Association shall not indulge in any Commercial activity with the objective of generating any income/profits. 2. The Associations, including the existing ones, desirous of being considered for recognition may apply to the office of the DGR, West Block IV, Wing-5, R.K. Puram, New Delhi-110066 with documentary proofs in support of and fulfillment of the conditions of recognition as mentioned above along with Memorandum of Understanding, Constitution, Bye Laws, Names and address of Office bearers, membership, certificate of registration by the Registrar of Societies. Any false representations and/or any false documents/evidences submitted shall make the concerned association liable for permanent rejection and penal action. 3. Verification of the membership of the Association as Ex-Servicemen Association shall be carried out through the DGR. 4. The recognition will not entitle any Association or any person concerned with it to any financial or other assistance from the Government. 5. The recognition to the Association shall be subject to its adherence of its Constitution, Bye Laws and observance and fullfillment of the conditions and criteria as laid down in the guidelines.They are to be followed in letter and spirit and the said membership can be revoked by the Government if any of the associations fail to comply with the guidelines. 6. Only the authorized persons as detailed by the Ex-Servicemen Associations shall be permitted to deal with the Government and/or submit application/letters. The associations shall, however, see that causes of individual nature of Ex-Servicemen are not espoused/supported. 7. The Government may dispense with or relax the requirements of any of these rules to such extent and subject to such conditions as it may deem fit in regard to any Association.